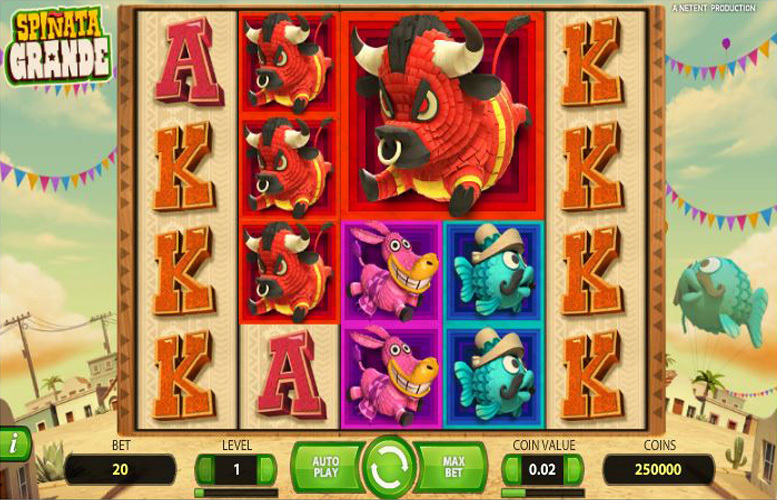 Spiñata Grande is a five reel and three row slot game with a varied choice of bet levels and coin values, and a theoretical return to player percentage of 96.84%. The game offers a top jackpot that can be worth up to £120,000 and is packed with special symbols and bonus features, such as free spins and a mini-slot game, to add extra excitement to the gameplay. Set in Mexico and featuring an array of piñata symbols, Spiñata Grande is a slot with a whole host of special symbols and additional features. Those will be covered in detail as part of our full review, which will also consider the game’s top jackpot, paytable and betting limits. All of the most valuable symbols in this slot depict different coloured animal piñatas and the most lucrative symbol of all is the red bull piñata. If a combination of five of those symbols lines up along one of the game’s 40 paylines, the player will receive a payout worth 300 times theirchosen bet level. If they were to set the highest possible bet level of ten, therefore, that would result in a payline jackpot of 3000 coins. As a result, that means that the overall top jackpot is a total of 120,000 coins and can be won if the red bull piñata symbol combination lines up along all 40 paylines at once. The maximum coin value that a player can set is £1 meaning that the top jackpot is worth £120,000 when that value is selected. One of the main attractions of Spiñata Grande is that it is a slot with a wide variety of special symbols and associated features. There are in fact a total of four special symbols which are called ‘Colossal’, ‘Colossal Wild’, ‘Colossal Bonus’ and ‘Free Spin’ symbols. Colossal Symbol – all symbols within the game can appear as ‘Colossal’ symbols as well as in their normal form. ‘Colossal’ versions measure either 2 x 2 or 3 x 3 spaces and appear as an overlay anywhere on the reels. 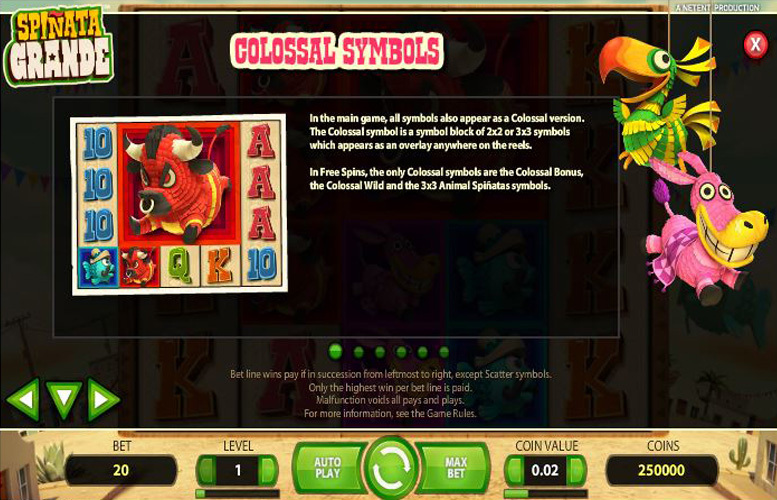 In free spins, only the ‘Colossal Bonus’, ‘Colossal Wild’ and ‘Animal Spiñata’ symbols can be colossal but in both free spins and the main game any part of a colossal symbol acts in the same way as the normal version of the symbol. Colossal Wild Symbol – ‘Colossal Wilds’ are 3 x 3 block symbols which appear on the middle three reels in free spins only. The wilds substitute for all other symbols apart from the ‘Colossal Bonus’ symbol and always go towards making up the most valuable possible combination for any payline. Colossal Bonus Symbol – the ‘Colossal Bonus’ symbol is the same size and if all or part of it appears on the reels, it turns into either a 3, 6 or 9 symbol mini-slot game. 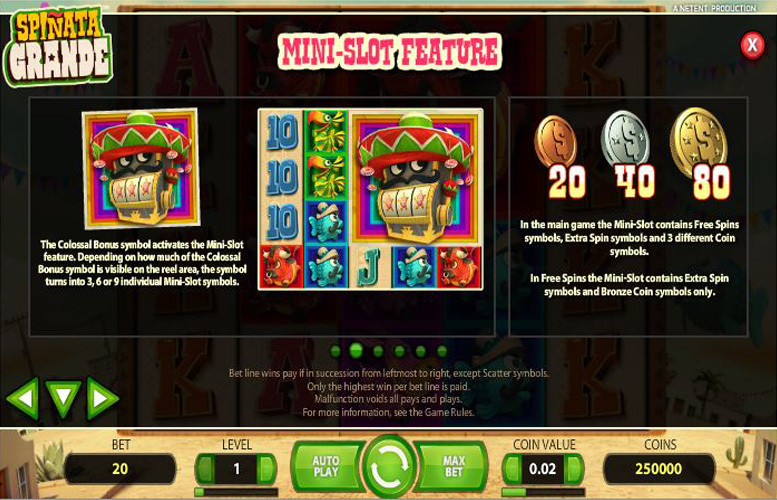 The rules and symbols of that mini-slot are explained within the Spiñata Grande paytable. Free Spins Symbol – the final special symbol is the ‘Free Spins’ symbol and if three of these appear anywhere on the reels, they activate five free spins. 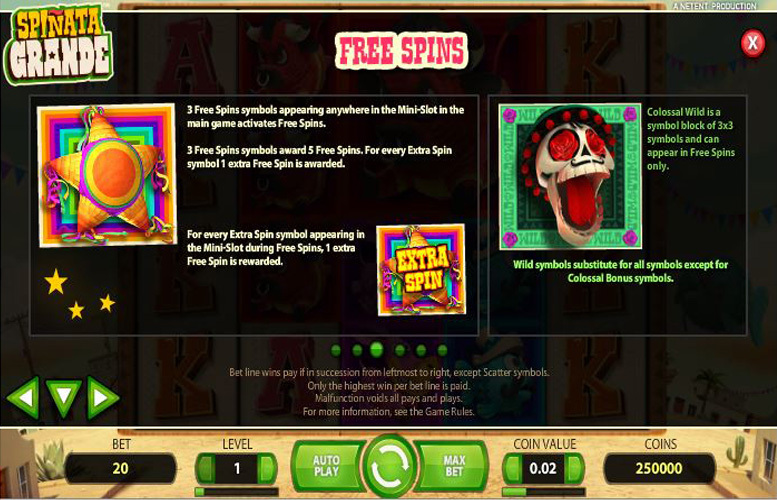 If more than three appear, an additional free spin is triggered for each additional symbol and all free spins are played at the same bet level and coin value as the spin which triggered them. The highest paying symbols in Spiñatagrande are those symbols which depict large animal piñatas, and the most valuable symbol combination of all is the one made up of five red bull piñata symbols. That combination from left to right along a payline pays out at a rate of 300 times the bet level for the spin. If a bet level of ten is selected, that means a payout of 3000 coins per payline and if the combination appears across all 40 paylines that results in the top jackpot of 120,000 coins. The second most valuable symbol in the game is the pink donkey piñata symbol, which pays out at a rate of 200 times the bet level for a five symbol combination. 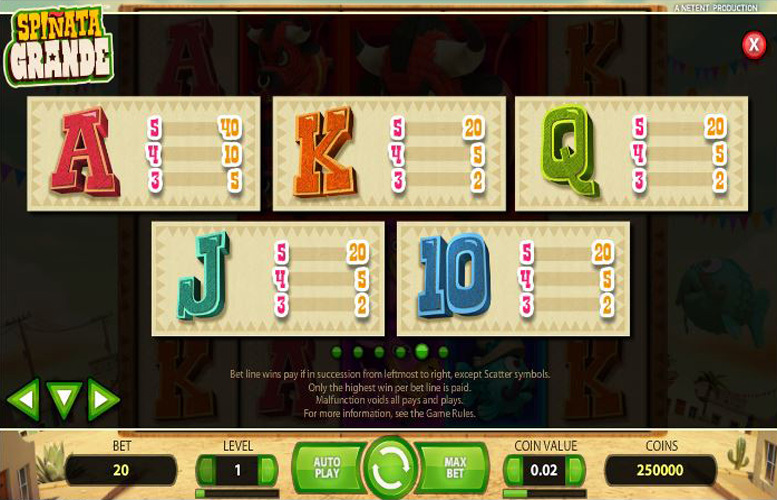 Spiñata Grande players can control how much they bet per spin by altering both the coin value and the bet level of the spin. Coin value dictates how much each coin wagered is worth and bet level determines how many of these coins are staked per spin. There are seven possible coin values between 1p and £1, and ten bet levels from 1-10 each of which add an extra 20 coins to a player’s bet. The minimum possible stake per spin, therefore, is a total of 20p and the maximum possible stake is £200. Spiñata Grande is a slot game which ticks a lot of boxes when it comes to giving players what they want. Unlike many games, this slot manages to combine generous top jackpots with good betting control and immersive and interesting gameplay to produce an all-around excellent game. At the highest possible bet level and coin value, Spiñata Grande’s top jackpot is worth a total of £120,000 and that represents an unquestionably generous payout which compares well with those available from other slot games. Below the maximum coin value and bet level, too, players have a great selection of other betting options which means that they can always be in charge of exactly how much they spend. What’s more, the slot also introduces players to a wide array of special symbols and linked additional features which keepsthings interesting and offers plenty of new ways to win. This game has a rating of 3 / 5 with 427 total reviews by the users.